Stocked with a tempting selection of raw oysters and clams eaten on the half shell as well as a variety of popular cooked and chilled seafood, foodies everywhere are increasingly flocking to the fresh tastes of shore-area raw bars, where the preparation may be simple but the flavors, textures, and diversity are anything but. At Rooney’s, which offers a large selection of oysters handpicked from among hundreds that Wordelmann has personally sampled in his cross-country travels, favorites include Chesapeake oysters, Kumamoto oysters from Humboldt Bay in California, and Jersey salt oysters from Cape May, all sold at $2.75 to $4 apiece and whose meat is “plump, firm, fresh, and briny yet sweet,” Wordelmann said. 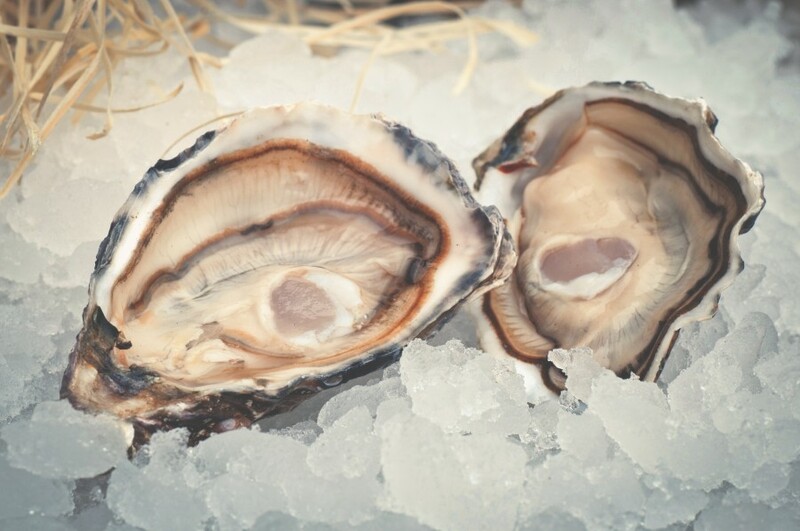 At Bistro 14, “we offer 6 to 8 varieties from the East and West coasts of the U.S. and Canada, including local Mullica River oysters from Maxwell’s Seafood,” Vaughan said, all priced at $2 to $3.50 apiece. Experts confirm that popular condiments for oysters include cocktail sauce, horseradish, lemon, Tabasco sauce, traditional oyster mignonette sauce made from a blend of vinegar, shallots and black pepper, or Rooney’s signature chipotle-flavored mignonette or ginger-lime relish, which reflect a growing trend towards creative seasonings. “Everyone has their own way to eat and enjoy oysters,” said Wordelmann, though he and Vaughan noted that the results are the same. Raw clams are another popular raw bar item. At Bistro 14, “we offer clams from McCarthy’s Clams, located 500 yards from our back door in Beach Haven,” Vaughan said. Priced at $1 a piece, “most customers eat up to a dozen as an appetizer, but one customer once ate five dozen in one sitting — that’s our record,” he shared proudly. “When you realize how fresh and close to the source these raw items are, that’s the excitement,” Wordelmann said. For seafood lovers, raw bars also include a variety of cooked and chilled classics, from shrimp cocktail, peel-and-eat shrimp, jumbo lump crabmeat cocktail, and Dungeness, snow crab, blue crab, and Florida stone crab (in season from October to May) claws to seafood salads and ceviches. At Bistro 14, customers can enjoy chilled mussels served on the half shell with curry mayonnaise as well as half of a Dungeness crab ($13) sourced from the Pacific Northwest region of the U.S. or Canada. Or try it all, as many larger parties like to do for a shared appetizer — Bistro 14’s “Plateau” or “Grand Plateau” platters, priced at $41 and $88, respectively, offer a selection of oysters, clams, shrimp, half of a Dungeness crab, crab claws, and mussels, while Rooney’s “Chef Ultimate Colossal,” priced at $145 and ideal for 4 to 6 people, offers six topneck clams, six littleneck clams, six U-6 shrimp cocktail, a 1½-pound chilled lobster, six Kumamoto oysters, six Blue Point oysters, and eight ounces of jumbo lump crabmeat.